Saturday marked the return of the Mad Decent Block Party to its first ever location, Philadelphia, and it was a good day. Holding the party right on the Delaware River, Diplo and his crew proved they have come a long way since the days of North Philadelphia Hollertronix parties and streetside block parties. Bringing along some of the biggest talent on his label, Mad Decent was not afraid to flex its new muscles. Arriving just in time for Nadastrom’s Moombahton-Trap combo set, the venue was already pumping with energy. With people dancing in fountains and climbing poles, it was clear we were in for a treat. Closing out with Kanye’s collab with TNGHT, “Blood On The Leaves,” Nadastrom set the tone for they day to come (spoiler alert: a lot of Kanye & Jay Z). Riff Raff was up next for a little thirty minute interlude of absurdist rap from him and his posse. Donning what appeared to be a set of pajamas, he rolled around the stage to the cheers of his loyal fan base like a new age rap God. Going back to the DJ game, Flosstradamus gave the crowd a little bit of classic and a little bit of funky sound. Keeping with their favorite blend of originals and hip hop, they added a bit of a bubbly element to the trap spectrum, even throwing in some “Tom Ford” of Jay-Z’s Magna Carta Holy Grail. Beyond that, they kept it great with Backseat Freestyle, Original Don, Crowd Control, and all the rest that we all have come to love in their sets. In what might be the biggest surprise of the day (although by all means still a great set), Dillon Francis played more towards an electro-moombah set (if that subgenre exists). Blending in new songs (including collabs with, among others, TEED) with old classics and amazing bootlegs (Blur’s Song 2 was the apex of the set), Dillon switched it up more than I’ve ever seen. I can only hope this is a sign of things to come for our favorite class clown. With his closer, a curtain dropped in front of the stage as the excitement mounted for Major Lazer. Finally, to hoots from the crowd, the curtain dropped and Major Lazer’s dominating, speaker filled stage (oddly reminiscent of Nero’s live stage) appeared. From there on out, it was nothing but wild antics. Vuvuzela Horns were tossed into the crowd, girls were brought on stage to twerk, fans were sent wildly crowd surfing, and fireworks even appeared across the river (Diplo swears they paid for them, although something tells me he was lying). In what was the highlight of the evening, though, packets of red powder were tossed into the crowd, and upon the drop of their remix of Macklemore’s “Can’t Hold Us,” the packets were ripped open and the entire crowd was engulfed in a red fog. It was unreal, to say the least. As everyone filed out of the show, it looked as if we had all just been part of a massacre. In a way, though, I guess we were. The party, however, was only just beginning. Down the street at Soundgarden Hall, the crowd got ready to welcome a legendary 2 hours set by Diplo. 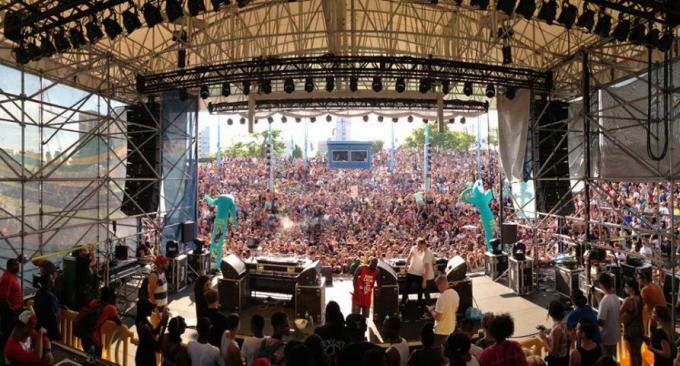 Coming on stage at 12:30, he reminded Philly why he was the brainchild behind Mad Decent. Going from rap classics like Tom Ford (again) and I’m Different to new wave EDM like Ode To Oi and Original Don. Possibly the greatest song of the set (and the day), however, is a new unknown remix of Kanye West’s “New Slaves” (although it is unknown, it sounds like it’s coming out of the Bauuer or Flosstradamus camp). As the end neared, Diplo had a hard time leaving the decks, as usual, he reared through an eclectic mix. The Fresh Prince Theme Song blew unexpectedly into Watch Out For This, and then a trapped out version of Frank Ocean’s “Thinkin Bout You” segued into Jay-Z and Rick Ross’s “fuckwithmeyouknowigotit.” And with that, the madness that was Mad Decent was to an end. If your city’s still got a date coming up, don’t miss it for your life. What Diplo can do never ceases to amaze me.